When my daughter was small she used to “help” me in the kitchen. She needed to see everything I was doing, and get right in the middle of it all. She loved making food as much as I did. Tish was especially helpful with fruit bowls – 2 pieces in the bowl, 1 in her mouth, 2 in the bowl… She’s grown now but we still share that love, and almost every meeting includes food of some sort. Tish has blessed me with grandchildren and now I have the opportunity to share my love of food with them! 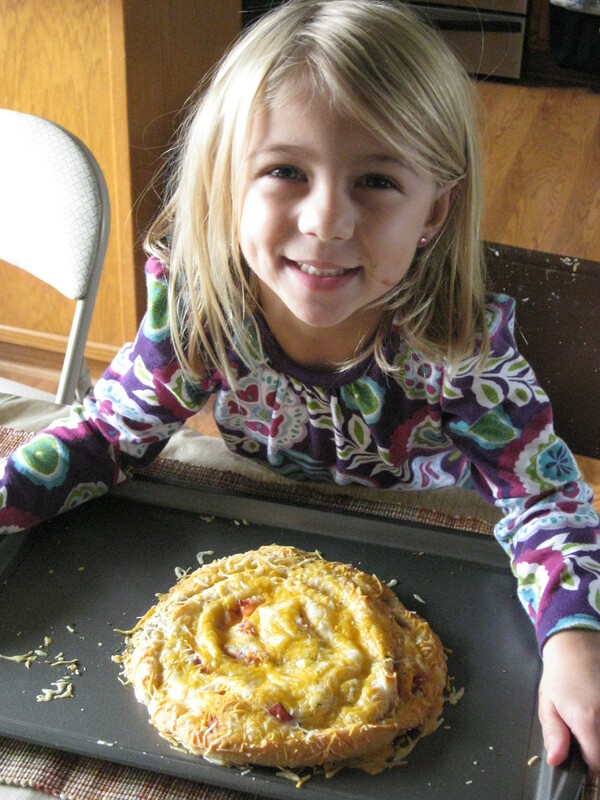 Cooking and baking with children should be fun and stress free. Simple things are best, as depending on the age of the child, their motor skills and attention span are limited. Today we made Ham & Cheese Breadstick Focaccia and Frosted Cakes. Both recipes were perfect for splitting into two portions, allowing the Cutie Patooties — Liela, 5, and Lily, 4 — to each make their own. I suggested strawberry cake, but the girls vetoed that and asked for chocolate. Almost brought a tear to my eye, I was so proud of their decision! We made a basic boxed mix, and the girls had fun adding ingredients and turning the mixer on and off. The highlight of the cake was the decorating — I had a lot of frosting and a house full of sprinkles, so I put those on the table and let the girls loose. 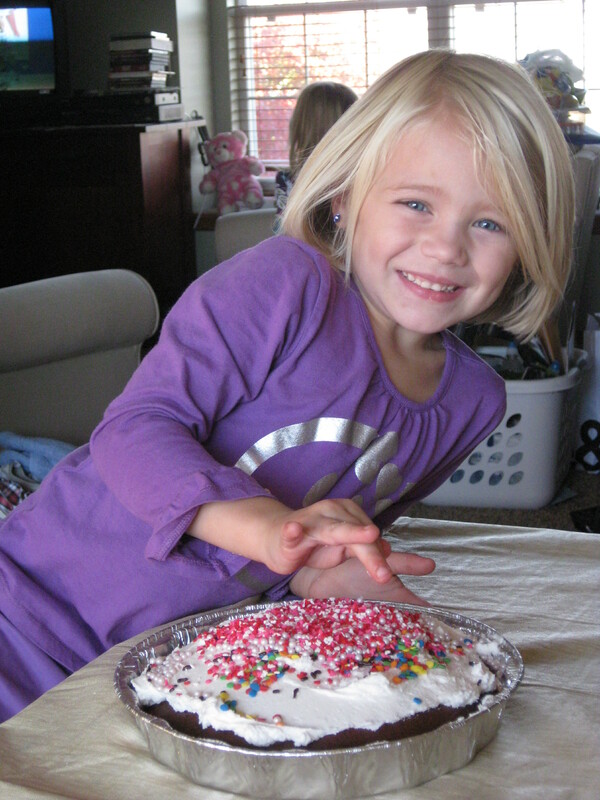 Every type of sprinkle was used on each cake, much to the delight of the girls. They proudly took their sugar masterpieces home and ate them for dinner! For the focaccia, I modified a recipe from the Pillsbury.com website: http://bit.ly/uuX4HN. This recipe has very few ingredients and is difficult to mess up, so it’s perfect for small hands or inexperienced cooks. Liela likes ham, so I cut deli ham into thin strips to use in place of the bacon called for in the recipe. Each girl got a can of breadstick dough. 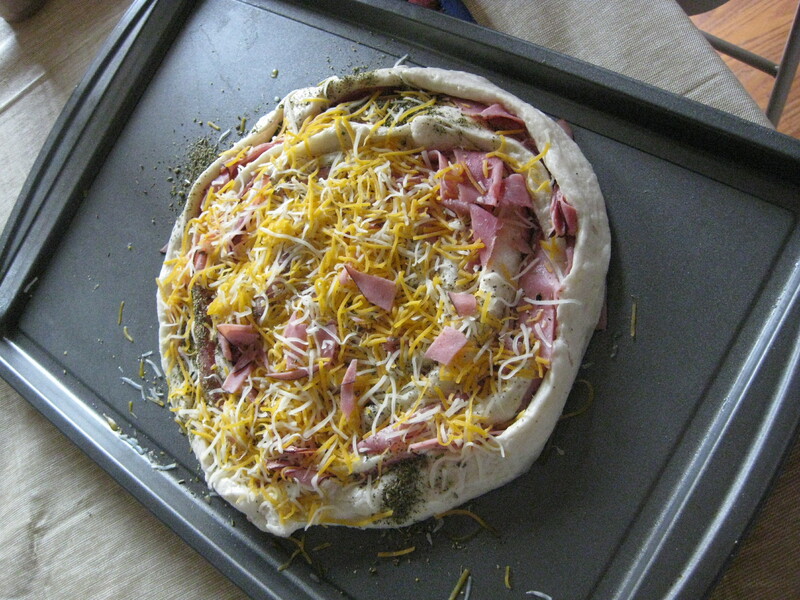 I helped them unroll it and spiral it around, with ham between the dough strips. We topped it with Italian seasonings and shredded cheddar/ Monterey jack cheese and popped them into the oven. We dipped the finished focaccia in honey mustard sauce, but BBQ sauce would have been equally good. Liela didn’t like it much but couldn’t really say why; Lily, Tish and I enjoyed it. This is a great recipe for feeding a crowd. We used about 2/3 of the dough and still had two good portions. It’s quite good for how simple it is, and can be modified to suit any taste. I think it would be delish with pepperoni in the bread, garlic powder and shredded mozzarella on top, and warmed pizza sauce for dipping. Our choices were a success! Here’s to many years of sprinkles and smiles shared with the Cutie Patooties! The recipes look great for little kids and cooking is indeed a wonderful way for the young and old to bond. It was fun to hear your personal account of their differing approaches to the recipes, and let me just say (in a completely non-JerrySandusky way) that your grandkids appear to have enough personality and on-camera appeal to be your full-time assistants if you ever start a cooking show!